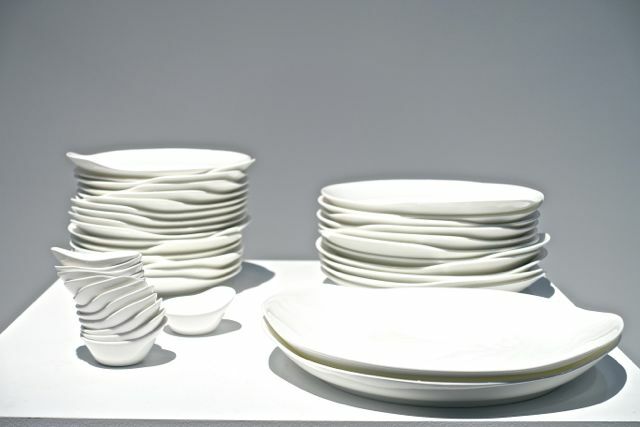 New York – Design – ICFF - Claesson Koivisto Rune. 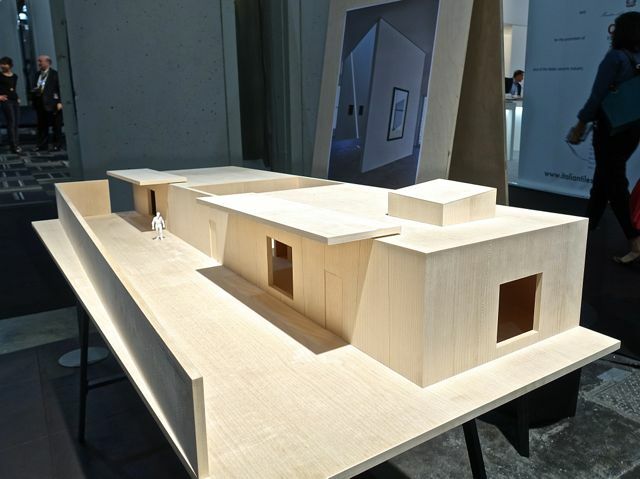 A small architectural exhibition of Swedish architects Claesson Koivisto Rune’s design for the new building for the Contemporary Art Gallery Inde/Jacobs in Marfa, Texas, including custom designed furniture and accessories was set up in a booth at ICFF. Above. 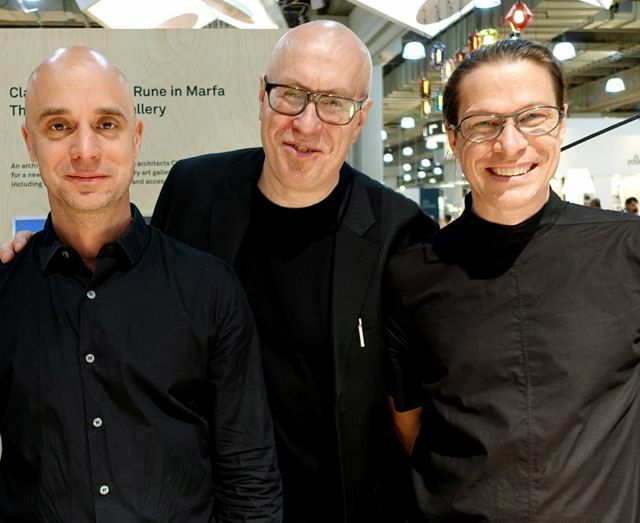 Marten Claesson, Eero Koivisto and Ola Rune. Contessanally - Attracted by: Love their work and delighted to find them all together for a photo. 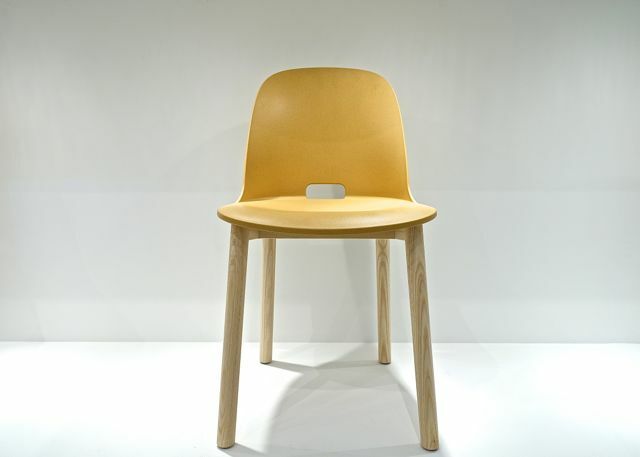 Design – ICFF - Emeco – Jasper Morrison - Alfi Chair. “Alfi is a highly comfortable, well made chair for public spaces and wherever else an impression of relaxed uniformity combined with visual and physical comfort is needed. 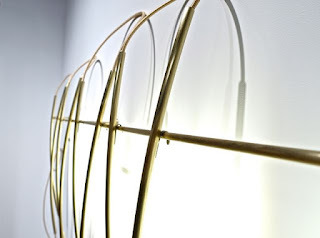 It was inspired by the woven cane brasserie chairs you see on Parisian sidewalks. The Emeco wood filled reclaimed polypropylene seat combines beautifully with the ash wooden leg structures, providing a rich play of materials and finishes. 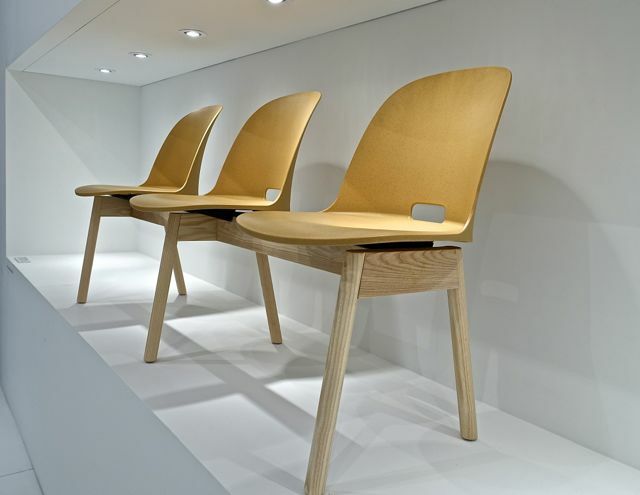 It's one of the most comfortable chairs I have designed.” explains designer Jasper Morrison. 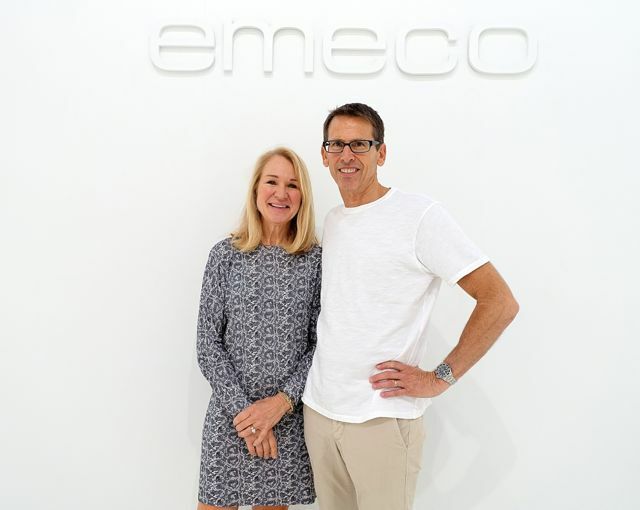 Contessanally - Attracted by: Have been following Emeco since their first collaboration with Philippe Starck’s for his Hudson Chair. 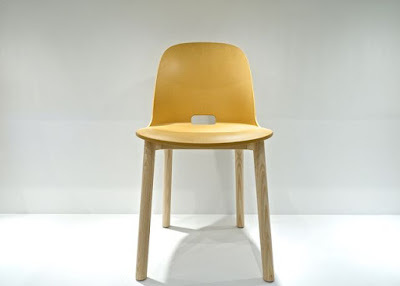 Plus - I love Jasper Morrison’s designs and have been following him also since his Thinking Man’s Chair for Cappellini in the early 1980’s. 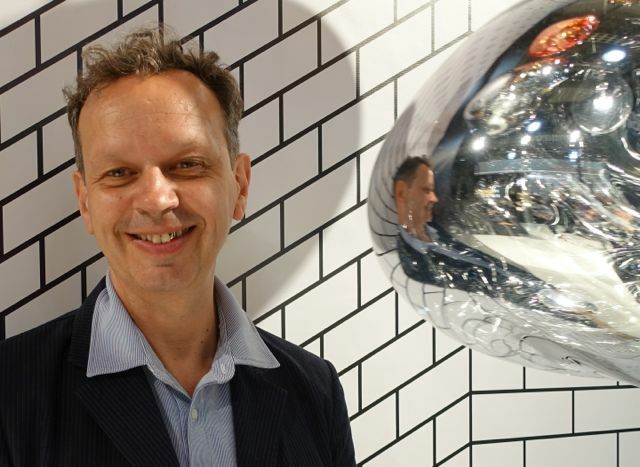 New York Design Week – Design – Tom Dixon. 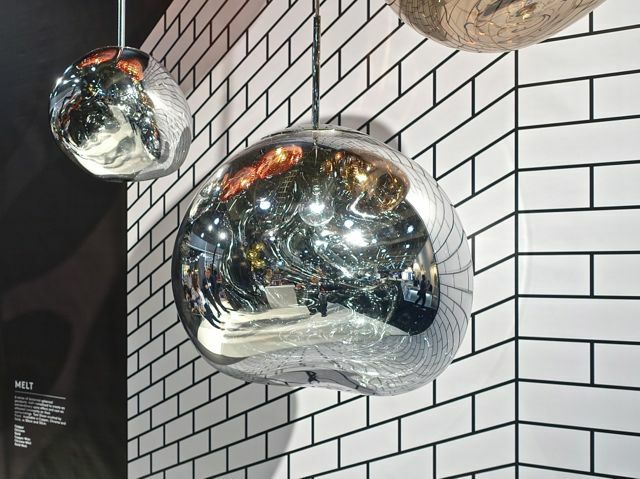 London furniture designer Tom Dixon with his Melt Pendant distorted spherical, half-metallized lights that create an optic effect and cast luminosity on their surroundings. 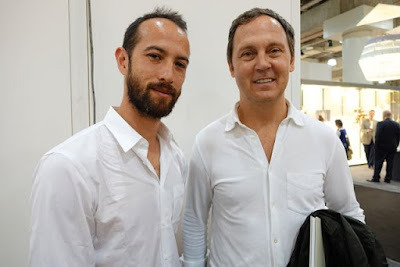 Contessanally - Attracted by: At last a smiling photo of Tom whom I have been following since his S Chair for Cappellini in 1992. 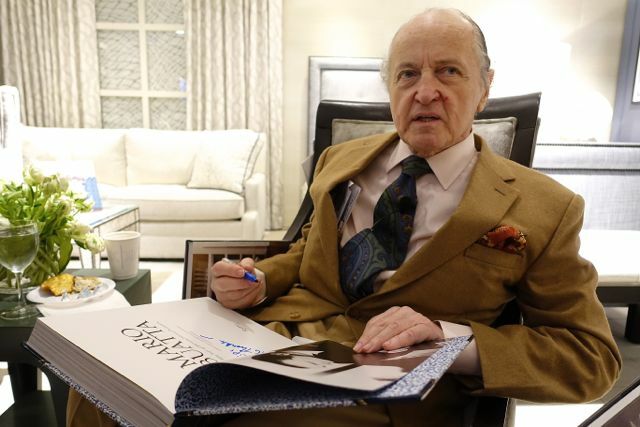 I love the way he promotes British Design will cool, in fact he was awarded an MBE by The Queen in 2000. 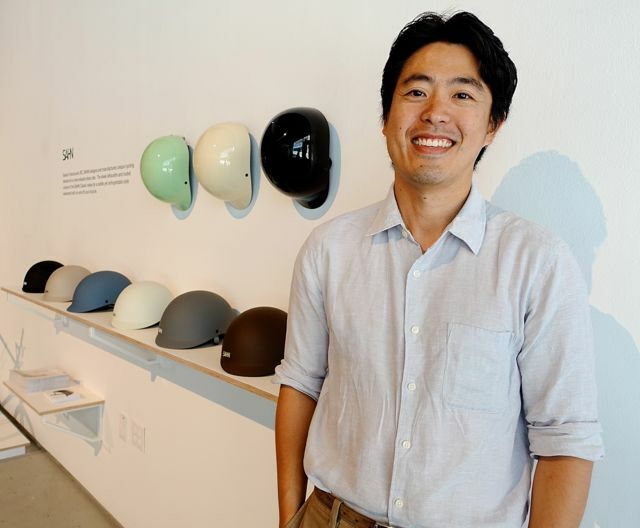 He has always been keen on using innovative technologies, such as 3D printing for sustainability and for what the Italians describe as Kilometro Zero or No Carbon Footprint. 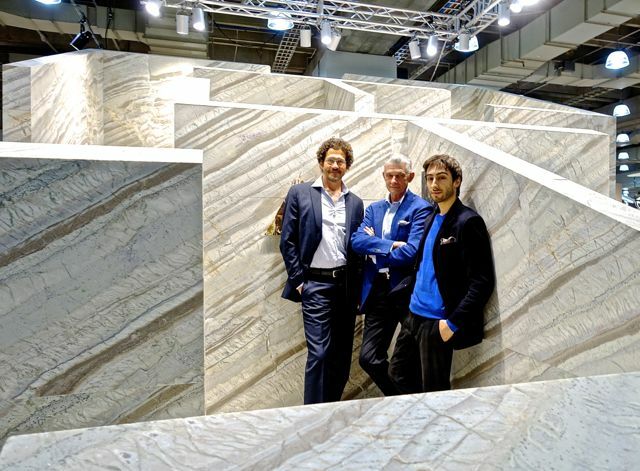 Contessanally - Attracted by: Anything Giulio Cappellini does, discovers or endorses is always something special and worth a visit. 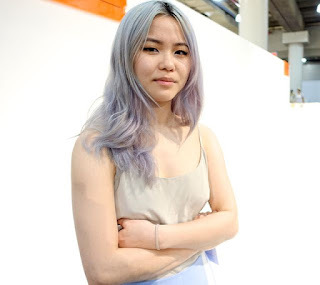 Design – ICFF – twenty2 – Pratt Institute – Deep 3D Wallpaper Collection. 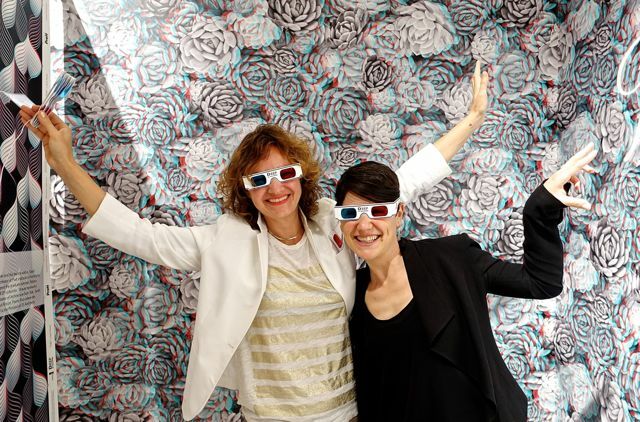 twenty2’s and Pratt Institute’s groundbreaking, 3D wallpaper collection, “Deep!”. twenty2, the design and printing studio of Kyra and Robertson Hartnett, has teamed up with Pratt Institute to release a curated collection of lush, 3D wallpapers in five different styles. 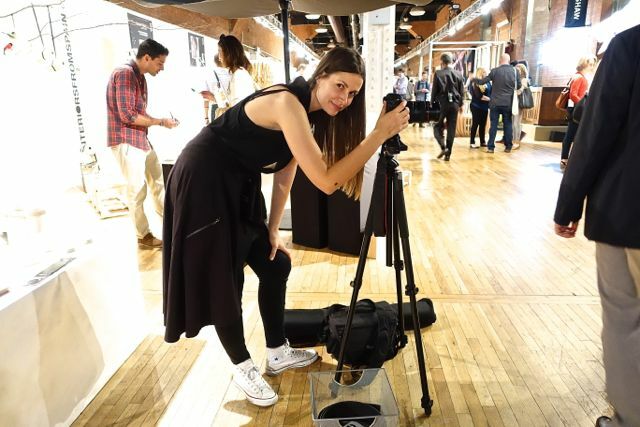 In 2011, Pratt Institute Visiting Associate Interior Design Professor and Yale Architect, Sarah Strauss, developed the graduate seminar, Pattern and Ornament, focusing on pattern, surface ornament and tiling, and invited twenty2 to critique and mentor Pratt Interior Design students. Over the past four years, twenty2 has been collaborating with, and challenging these students to push the design limits of pattern repetition and dimension, and are excited to now bring the best of these designs to life. Above. Sarah Strauss and Kyra Hartnett. Contessanally - Attracted by: Wow! 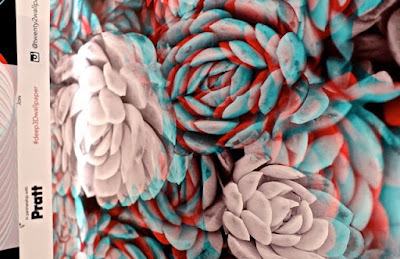 3D wallpaper. What fun! 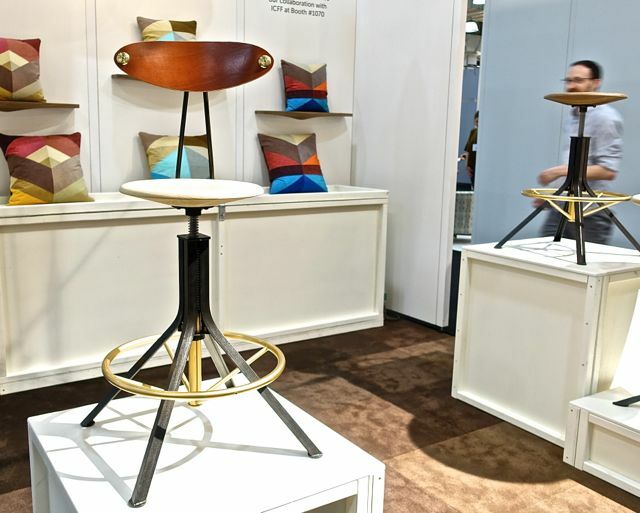 Design – ICFF – Potterton Books. 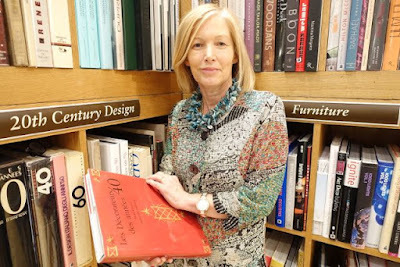 Potterton Books are international specialists in Fine and Decorative Arts, Design and Decoration books. Their main headquarters is situated in the beautiful grounds of an 18th century house in North Yorkshire, England, and was founded in 1980 by Clare Jameson, above, who is widely regarded as a leading authority in this field. They also have bookshops in London and New York. And, they also curate private collections and libraries. 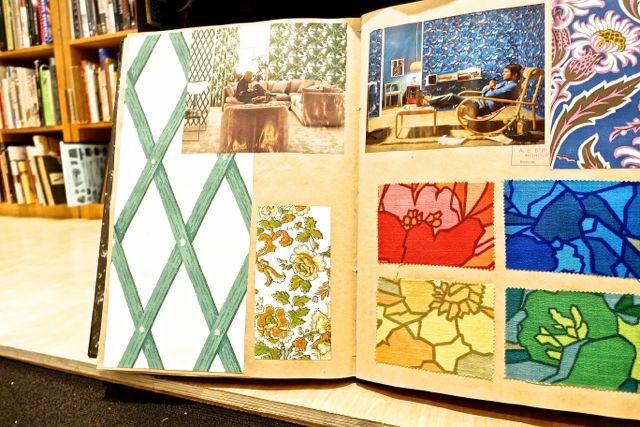 Contessanally - Attracted by: I love books and bookshops and was attracted by the Wallpaper and Interior Design Scrapbooks of the 1960s, complete with an overview of the taste of the times. Design – ICFF – Todd St. John. 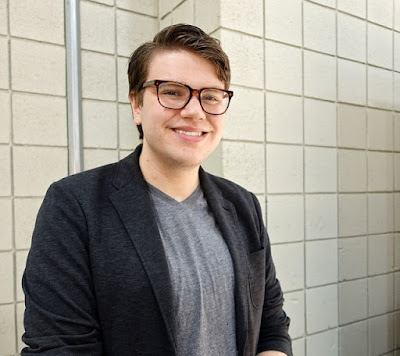 Todd St. John is a graphic designer, image-maker, and animator. 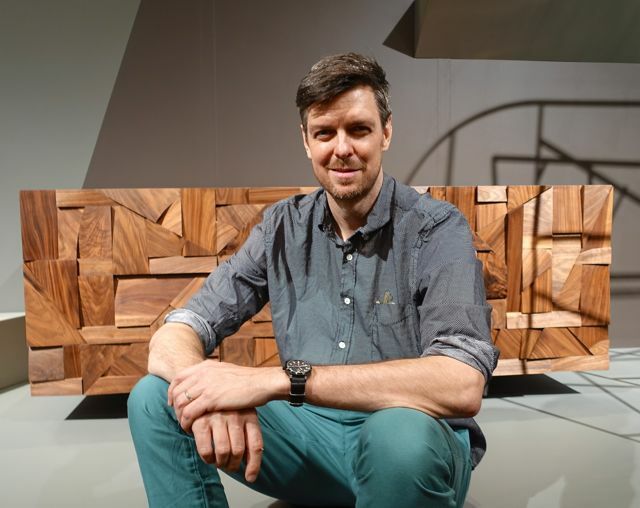 This is his first furniture collection, which is made in Brooklyn. 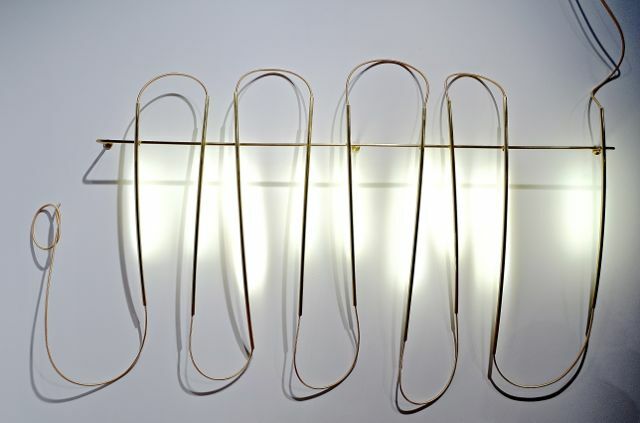 In the surfaces and forms of all his work, whether furniture, product, graphic campaign or illustration, reside the crosscurrents of his varied experiences and interests in texture, scale, light, movement, image, abstraction, and materiality. Contessanally - Attracted by: the “jigsaw Puzzle-ness” of the designs. 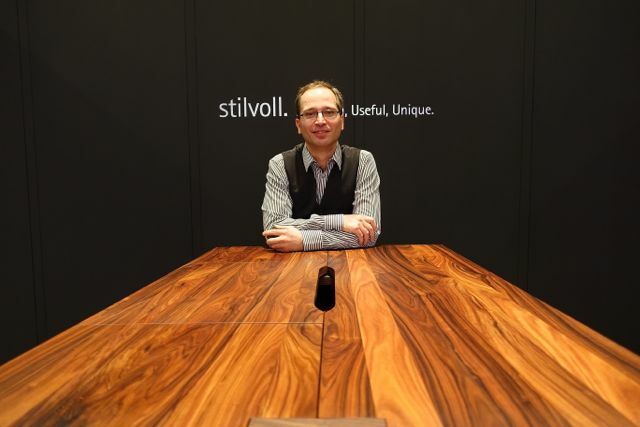 Design – ICFF – Stilvoll. The Crescendo C2 Maximus tables’ name is derived from the Latin “crescere – to grow“ and “maximus – the greatest”. 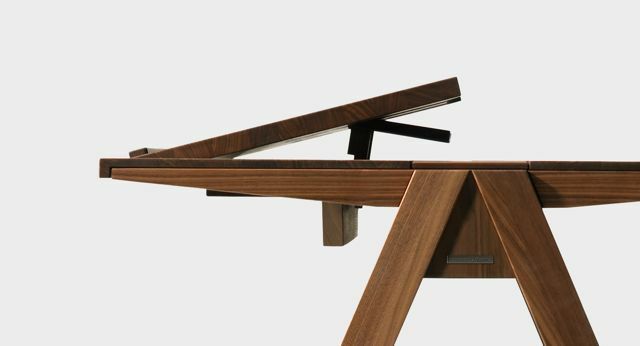 Designed by Bjorn Kersting it can be a standing-desk, a workstation or a secretary depending upon the desired function. 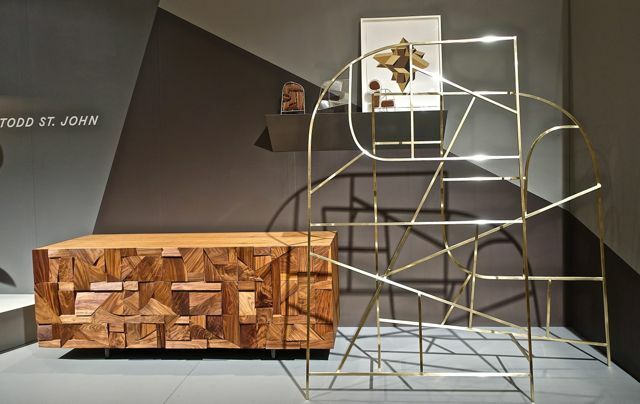 It is a highly versatile piece of furniture, which unites uniquely traditional handicraft with the needs of people of the 21st century. Made from 400 pieces of wood each handcrafted from a piece of solid American Walnut. The height can be adjusted from 52,4 to 127,7 cm and the top can be inclined and the center opens up to reveal trays and compartments of different shapes and sizes. Contessanally - Attracted by: the aesthetics, the workmanship and how very clever the design is; when the top slides open a treasure trove of trays and possibilities arises. 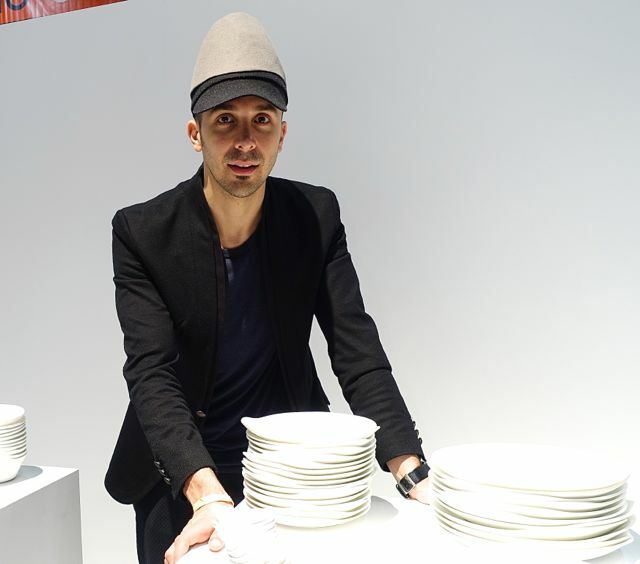 Design – ICFF – Voutsa. Voutsa employs traditional painting techniques or experimental application methods for their wallpaper and fabric collections. 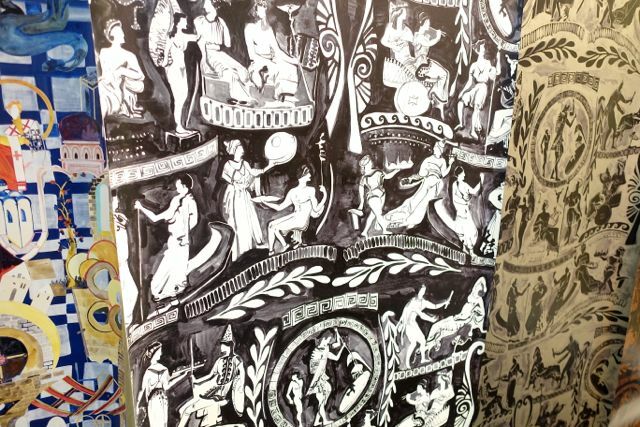 It is their vision to propel hand-painted wallpaper into fresh new territory, simultaneously paying homage to its rich history and traditionally decorative nature: no printers, no repeats, no outsourcing. Every installation is one of a kind, permanent or removable. 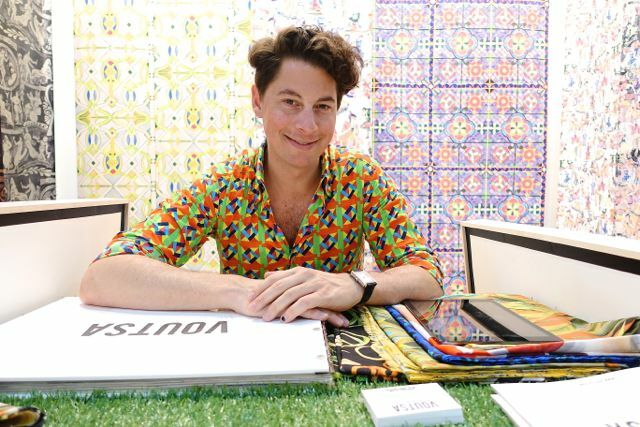 “As Voutsa grows, it remains my desire to create wallpapers that ignite the eye and activate a room, generating fantasy through brush strokes, abstraction and bold coloration. 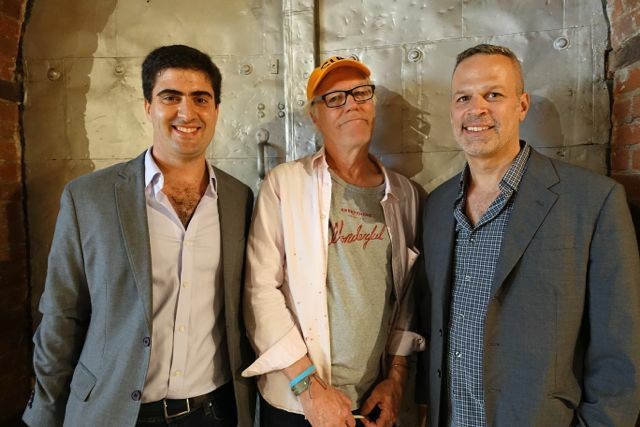 In the end, I am merely bringing life to our walls, and our walls to life.” Founder and designer George Venson, above. 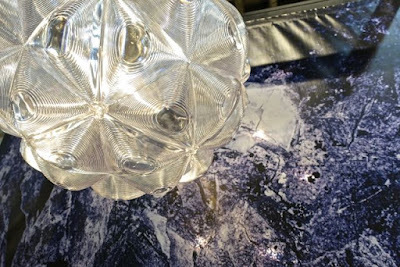 Contessanally - Attracted by: the artisan-al brush-like and watercolor quality of this digitally printed wallpaper. 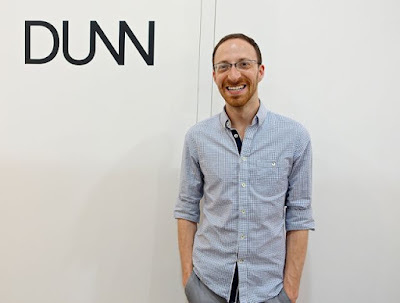 Design – ICFF – Dunn. 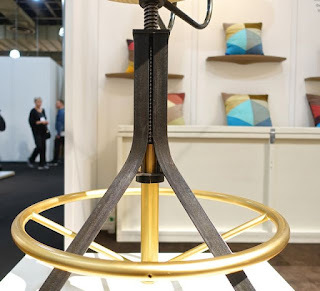 Established in 2010 by Industrial designer Asher Dunn, who won the Best New Designer Award that year at ICFF. The American designer is committed to the creation of beautifully designed and meticulously crafted products, creating timeless pieces influenced by love of nature. The new Architect’s Collection is a refined combination of industry and luxury. 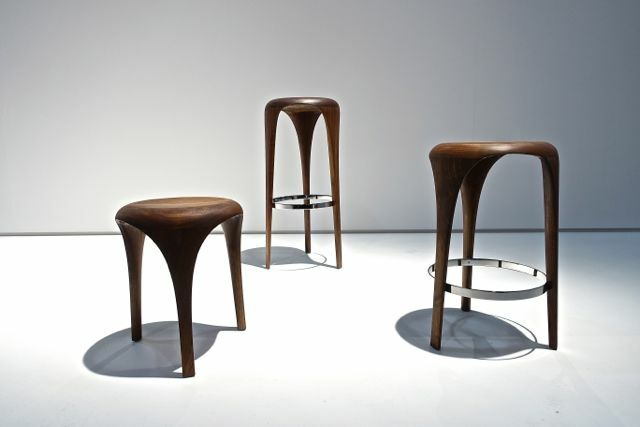 The collection includes a stool with or without a backrest and a cafe table. 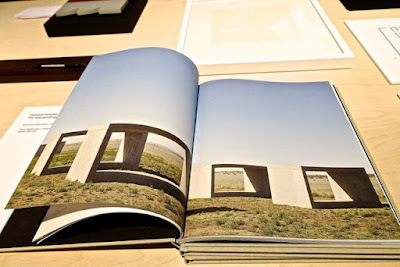 Contessanally - Attracted by: I have been following Asher, since 2010, so was pleased to see the refinement and evolution in his work. Bernhardt Design and Emerald Expositions team up annually to present ICFF Studio each May. This scholarship program is a juried competition created as a platform for young designers to showcase their existing prototypes to manufacturers, retailers, and the media. 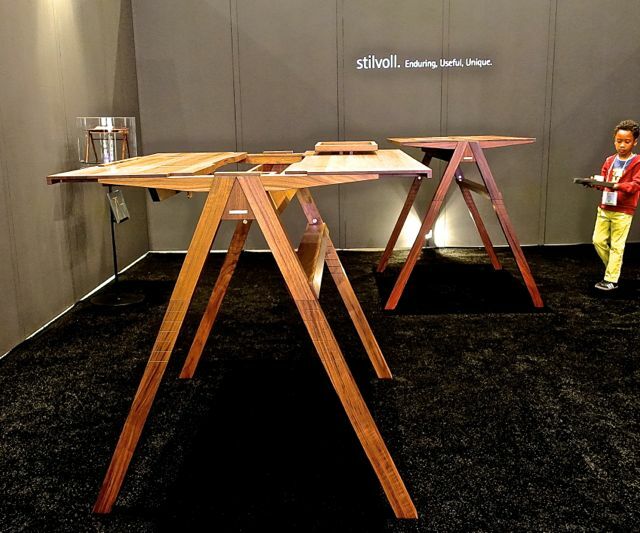 Contessanally - Attracted by: the organic shape and slick-ness of the stools. 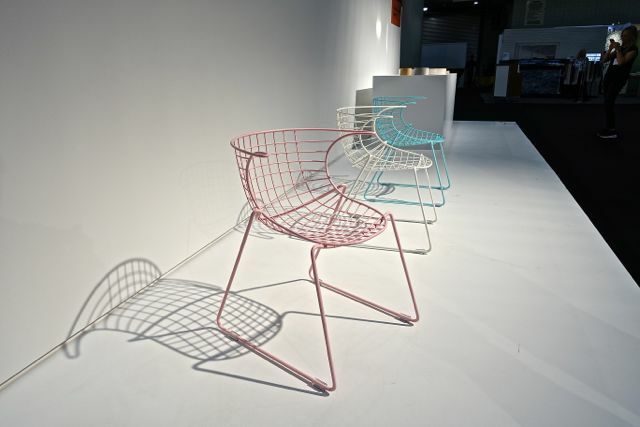 Contessanally - Attracted by: how she tweaked/was inspired by the Bertoia classic chair, with the graceful armrest curves and the pastel colors. Contessanally - Attracted by: The concept of how, the random stack-ability of the plates, embodies new scenarios each time you open your cupboard. 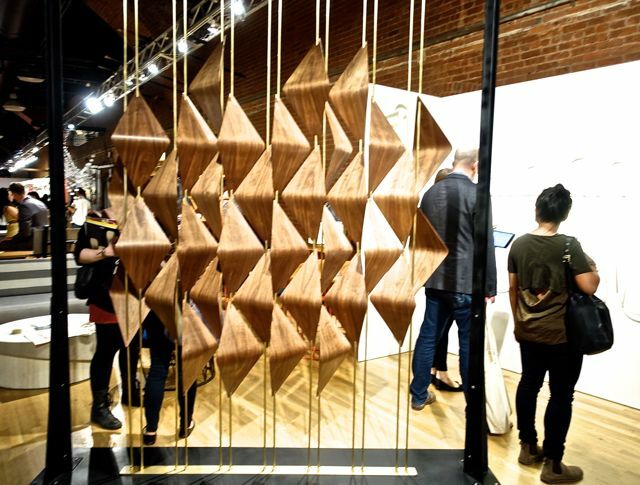 Design – Wanted Design - Elish Warlop – Walnut Window Shades. Elish Warlop Walnut Window Shades are an exploration of 3 dimensional tessellations; giving a flat pattern form. The shades hide and reveal what is behind through a simple rotation of each bar. When situated in front of a window they register different patterns of light throughout the day. 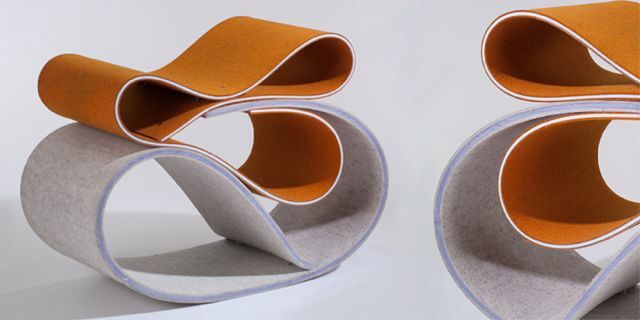 When situated in the center of a space, they can both divide and connect depending on the angle of rotation. Contessanally - Attracted by: the elegance of Warlop’s work. Design – Wanted Design - Elish Warlop. 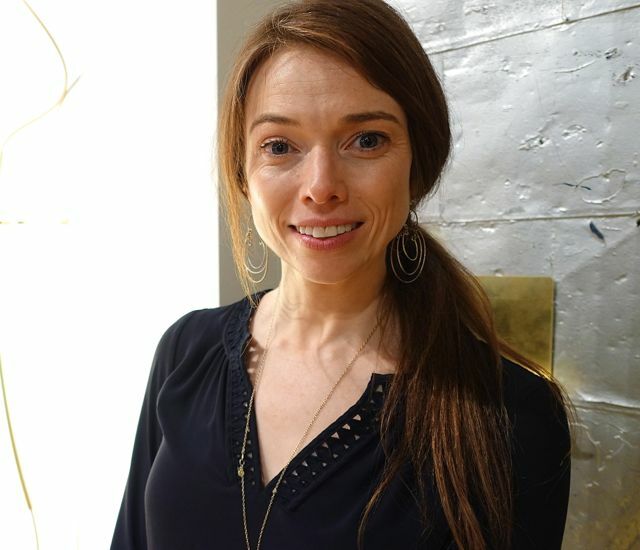 Architect Elish Warlop’s Design Studio is based in Denver; she is a multidisciplinary design firm focusing on furniture, lighting and architecture. 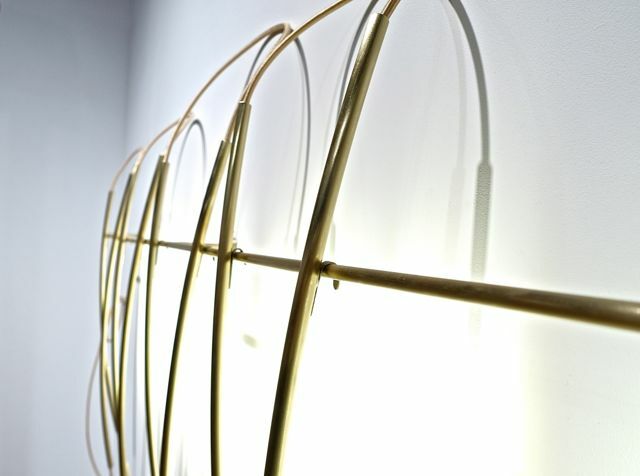 Her work addresses notions of scale, repetition, and engagement. Experimenting with modeling, prototyping, and testing the limits of each design, is an important part of the studio's process. Design – Design Junction – Sahn Helmets - Classic Matte Sahn Helmets. 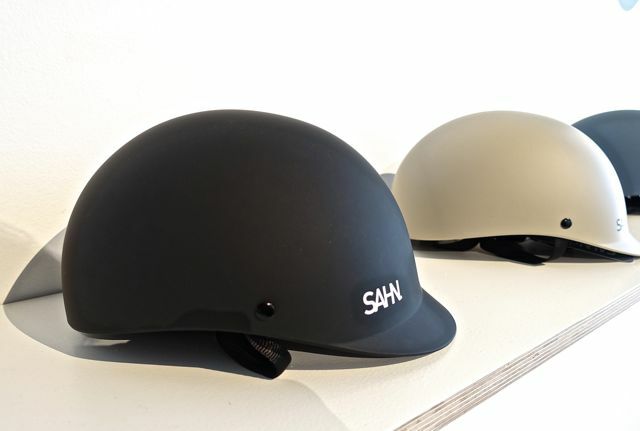 The Sahn Classic is a simply styled, low profile alternative to conventional urban cycling helmets. Its silhouette is both visually striking and minimal, allowing the design to complement your personal expression without pretension, gimmicks or complexity. It comes in eight matte distinctive shades. The word Sahn is based on the word for “without” – sans – and reflects the minimal approach to the company’s design. Contessanally - Attracted by: The elegance and simplicity of the design, the matte finish and that the design evokes the classic riding hat.